The spokesman for the liberal Constitution Party, Khaled Dawoud, has been stabbed in central Cairo on Friday afternoon. According to Al-Ahram Arabic news website, the former spokesman of the National Salvation Front (NSF) was stabbed in his chest and his hand in the Mounira district. Shortly after the assault, Dawoud told Al-Ahram Arabic news website that he was attacked by protesters while driving his car down Qasr Al-Aini Street in front of Abou Al-Rish Bridge. He told Al-Ahram that his car was attacked and protesters pulled him out of the vehicle, beat him and stabbed him with a knife. Dr. Mohamed Salah from Egypt's Children’s Hospital, where Dawoud was transferred, told Al-Ahram that he is "stable." On their official Facebook page, the Constitution Party accused members of the Muslim Brotherhood of the attack against Dawoud. "The Muslim Brotherhood has rewarded his defence of their future by stabbing him," read a post on the party's page. 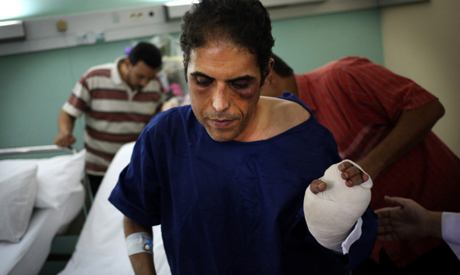 Former Constitution Party leader Mohamed ElBaradei denounced the attack on Dawoud and wished him a quick recovery. "The barbaric assault on Khaled Dawoud ... reflects the size of the tragedy we're living through," said the former vice-president on his official Twitter account. Dawoud, a staunch oppnent of the Mohamed Morsi and the Muslim Brotherhood, resigned from the NSF in mid-August to protest the group's support for the violent dispersal of two large protest camps established by Morsi's supporters. The dispersal by the security forces left hundreds of protesters dead. Downtown Cairo witnessed unrest on Friday as security forces fired teargas at pro-Morsi protesters who had attempted to enter Tahrir Square. Four pro-Morsi protesters was reportedly killed in clashes in Cairo between protesters and local residents. THIS GUY WORKING FOR ISREAL AND USA TO MESS UP Egypt .brotherhood is a loyal of democracy in Egypt . So I guess according to the mb, morsi supporters & islamic extremists its ok to just go around beating, stabbing, shooting & terrorizing anyone in the population who disagrees with them..and then they wonder why the majority of Egypt is against them & why their members are being imprisoned..They sure know how to make islam look like the religion of peace..the sad thing is that its the rest of the islamic faith that is paying the price for their actions..They seem to think they can live above the law..They need to accept the fact that morsi is gone & not being reinstated instead of going around terrorizing the country. I guess their year in power did not destroy the country enough for them so they want to finish destroying it. NOTHING BUT A BUNCH OF TERRORISTIC THUGS WHO CANNOT FACE REALITY OR ACCEPT RESPONSIBILITY FOR THEIR OWN ACTIONS!! Terrorist act from Terrorist party.